2.22 carat Pink Cushion Sapphire with half moon shape diamonds .34 carats set in platinum ring. 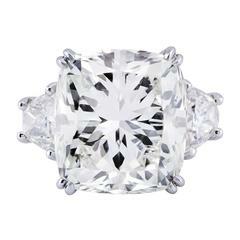 1.13ct OP/I1 GIA certified Vintage Cushion cut diamond set in an 18k rose gold and silver mounting. Ring is currently a size 6 and can be sized to fit.